The Scottish government says its wants changes to the devolution settlement following the failure to reach a deal over the EU Withdrawal Bill. MPs have been debating changes to the Brexit bill as ministers seek to reverse defeats in the House of Lords. Holyrood has not given its consent to the bill - but there was little time for MPs to discuss its concerns. Scottish Brexit minister Mike Russell said devolution was "being treated with contempt by the UK government". He said the Scottish government would be looking at ways to "find a new arrangement" for the relationship between the Scottish and UK parliaments. And he said that "we can't carry on with devolution as it is now". Scottish Secretary David Mundell said he was "very disappointed" by the lack of devolved consent, but insisted that "the bill can prevail without it". MPs are debating the EU Withdrawal Bill, the UK government's flagship piece of Brexit legislation, across two marathon sessions on Tuesday and Wednesday. The government saw off a move to give MPs the decisive say on what happens over Brexit if they do not agree with the deal it negotiates, winning the key vote by 324 to 298. The concession offered by ministers is believed to include offering a new parliamentary motion if the Brexit deal is voted down by MPs and peers. Devolution was to be debated in the second half of Tuesday's session, but there were only a few minutes left for this after voting on amendments went on for almost three hours. The SNP's Westminster leader Ian Blackford said the fact there was no time to properly debate the bill's impact on devolution "rubs insult into injury". MSPs voted by a margin of 93 to 30 to refuse consent for the Brexit legislation last month, with Labour, the Greens and Lib Dems backing the SNP in the final vote. It followed a lengthy row between the Scottish and UK governments about how powers coming back from Brussels after Brexit will be used. Changes have been made to the bill to reflect a deal struck between the UK and Welsh governments, but Mr Russell says these do not go far enough. First Minister Nicola Sturgeon wrote to the Speaker of the House of Commons, John Bercow, on Sunday urging him to let MPs "properly" debate devolved consent. But with the UK government seeking to overturn many of the 15 defeats they suffered as the Withdrawal Bill passed through the House of Lords, there was ultimately little time for discussion of devolution. This will be the first time since the Scottish Parliament was re-established in 1999 that Westminster will have legislated across a devolved matter without the consent of MSPs. What does Mr Russell say? 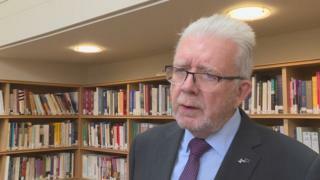 Mr Russell told BBC Scotland that "this is not the way the UK is meant to operate", and warned that the Scottish government would be seeking a new way of working. He said: "The reality is that we can't carry on with devolution as it is now, because devolution is being treated with contempt by the UK government. "All the systems that are meant to work are clearly of no importance to them. So over the next few weeks we'll be looking at ways in which we can say, look, we've got to find a new arrangement here because this present arrangement does not work." Asked what Scottish ministers could do going forward, Mr Russell suggested that they might not cooperate with the UK government in future Brexit matters. He said: "There are many options, but what I want to do is look at the way in which for example clause 11 orders - these ways in which the UK government is going to impose their will on Scotland - will go forward. "I cannot imagine that we would want to cooperate on those in areas which are unsuitable for the Scottish Parliament." Scottish Labour MP Paul Sweeney also said it was unacceptable that more time had not been set aside to discuss the impact of the Brexit bill on devolution. What about the UK government? Mr Mundell said he was "very disappointed" that an agreement could not be reached over devolved consent, but said the bill could still proceed. He said: "We talked about it right up to the last minute, but we're just not in agreement on the interpretation of our constitution. "What we've got is the constitutional settlement that people voted for in the 2014 referendum. People in Scotland accepted the settlement. "The SNP and Nicola Sturgeon don't accept the current settlement - they want independence, so I can understand why they don't like the arrangement. But it is in accordance with the constitution as we have it, so the bill will proceed." Mr Mundell said a deal was still possible, "even at this late hour", adding: "We won't be power-grabbing, we won't be overriding the Scottish Parliament, we'll be seeking their consent on all the matters this bill relates to." What is the Brexit powers row all about? The Brexit bill says that the "vast majority" of the 158 areas where policy in devolved areas is currently decided in Brussels will go directly to the Scottish and Welsh parliaments after Brexit. But it has also named 24 areas where it wants to retain power temporarily in the wake of Britain's exit from the EU, including in areas such as agriculture, fisheries, food labelling and public procurement. It says the "temporary restriction" on the devolved governments using some of the powers returning from the EU is needed "to help ensure an orderly departure from EU law" and allow the same rule and regulations to remain in place across the whole of the UK. But the Scottish government argues that it would leave Holyrood unable to pass laws in some devolved areas for up to seven years. It has produced its own alternative Brexit legislation, which was passed by MSPs in March but is currently subject to a legal challenge by the UK government.